My name is Mark and with my team I welcome you to Easirent Car Hire at Exeter Airport. 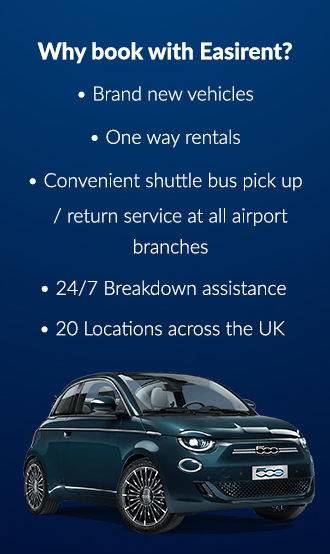 Our branch is located just a few minutes away from the airport making us the best choice for affordable car hire in the local area. We have a full selection of small, family and executive cars all ready for collection. If you are looking to explore Devon/South West of England give us a call on +44 01392 798540 or make a quick and easy online booking through our official website where we have the lowest prices for all our vehicle hire. Arriving at Exeter Airport by air. Please call the Easirent Branch on 01392 798540 when collecting your luggage to arrange shuttle bus transfer. Our branch is only a few minutes drive from Exeter Airport. Arriving at Exeter Airport by train. Exeter has two main train stations, Exeter St. Davids and Central. Both have excellent connecting routes to the rest of the South West and London. There is no station located at the airport but there are taxis or bus service (service 56A/56B) ready to take you to the airport which is just 15 minutes away from St. Davids station. Arriving at Exeter Airport by bus. Stagecoach operate a bus service to and from Exeter airport that links to Exeter St. Davids station. For an up to date timetable please click here, please note the route is limited on a Sunday and Bank Holidays. Dropping off your hire car at Exeter Airport Please return your rental car to the Easirent office and you will be transferred back to the airport in the shuttle bus. The journey from the branch to the airport is approximately 10 minutes. Security: You should be made aware of the latest security procedures at the airport. This includes up to date information on size and weight restrictions for baggage and UK government regulations relating to all security matters including liquids, food and electronic devices. Check-in: The airport recommends that you should be ready to board your flight at least 20 minutes before take off. Security checks, road traffic congestion and kiosk ques may add time to your check in so please ensure you arrive with plenty of time to spare. For information regarding lost property you can email the airport or use the contact form on the airport website. For pre-security food and drink take a visit to The Café, We Make. With freshly made sandwiches, snacks and refreshing hot/cold drinks on offer, this is the time to relax and unwind before your flight. There is also a WHSmith fully stocked with bottles of drinks, sweets and delicious savoury snacks. After security: The Fed & Watered Wine & Dine serves up tasty food including hot and cold meals, hearty breakfasts and a bar which is located upstairs. Take advantage of some fantastic after-security shopping opportunities with World Duty Free. Tax free products include perfumes, skin care, alcohol and fashion apparel. There are numerous toilet blocks and mother/baby changing facilities at the airport which are situated right next to the main toilet areas.